While I’m still working on the Alpha Project, I have been watching several shows from the new season, as well as a couple of carry overs. As it turns out I am watching 5 sports anime that are airing at the same time. This is very unusual. A couple of years back it was not uncommon to go for multiple seasons without a single sports anime. Now we have shows airing that are based on Baseball, Tennis, Cycling, Volleyball, and Ping Pong. 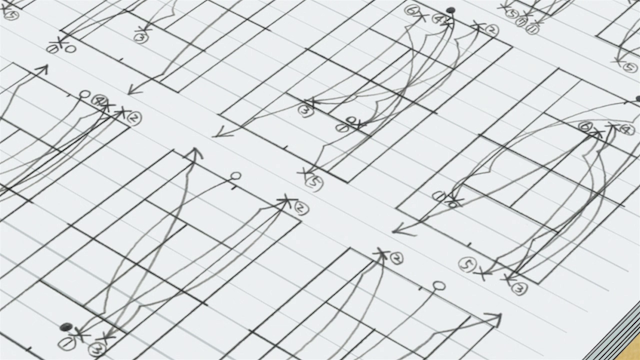 Ping Pong features inspired art direction as expected from Masaaki Yuasa. Folks who don’t like an anime because it “doesn’t look anime enough” are really choosing to deprive themselves of a gem this season. The characters are all flawed in very human ways. they are trying to achieve something or avoid something not because they are better than us. None of these characters are traditional shounen leads, with the possible exception of Akuma, who rose through the ranks by working really hard. Even the adult characters seem twisted; instead of cheering on the main character because he is happy to see him develop his potential, the coach takes on Smile because he thinks he can use him to win. The coach clearly wasn’t giving the rest of the team his full attention, and even seems to tolerate bullying by the upperclassmen. Of the two continuing shows, I was initially more interested in Yawamushi Pedal, but it recently has gone in the wrong direction. 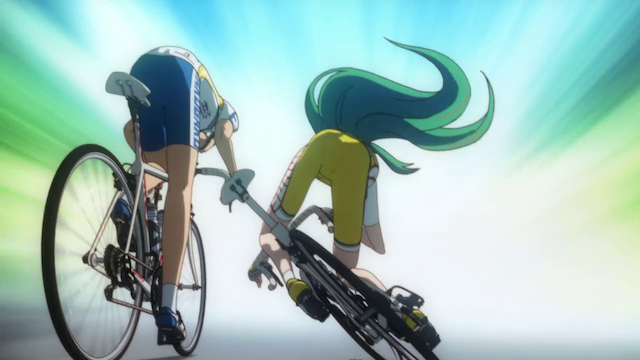 Yawamushi Pedal ~ the battle for the inter high is on. Initially I found Yawamushi Pedal appealing because the subject, cycling, seemed fresh, and the main character wasn’t obnoxious. Unfortunately, since the Inter High arc began, the show seems to want to be more like One Piece, than a thoughtful sports anime. Explanations about the importance of wind resistance and such have been dropped in favor of battles between super beings. Probably the worst was the episode about the sprinters, where one person thought he would win because of his abs, and was shocked to lose because the other two racers had 1) a good relationship with the wind, and 2) an abnormally large lung capacity. The next villain doesn’t even look human. It’s really a shame to see a decent show go on past the point of having good ideas. Ace of Diamond ~ a team sport. In contrast, Ace of Diamond rubbed me the wrong way initially. Baseball has been done many times before and done well. Further the main character was is and probably always will be utterly obnoxious. 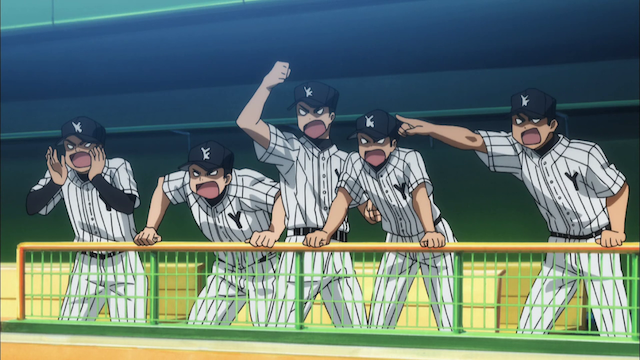 However, unlike Yowamushi Pedal, this show still has legs, because it really seems like a show about baseball. People have special skills, but nobody has superhuman skills. Further the recent arc in which Seido played against Akikawa showed how good the show is at developing a rival (not a villain) so the pressure really mounts. Giving the opposing side a backstory gives you some insight into why the opposing side in a shounen sports anime is not to be laughed off — but it is also something more. It should ideally make you care enough about that person/team to make you feel a bit ambiguous about wanting to see them lose. You need to see them as deserving to win, even though you have a spent more time with the main character(s). That’s the pressure you feel when you really are unsure how this thing will turn out. Ace of Diamond did an excellent job giving Shun, Akikawa’s “clockwork” pitcher a believable skill, and a human story. Haikyuu suffers from the annoying male lead, only the annoying-ness is spread across multiple characters. There hasn’t been a lot of volleyball yet, because the team is still coming together (as of episode 6, they are playing their first match as a team, but it is a training match, not a part of any official tournament). I like the fact that this show is working with Volleyball, which is an unusual sport to feature. It’s too early to say if I can stand to continue with this show. I find the interactions between the main characters very annoying, and haven’t seen enough tension to make me think they can pull off a good game. The basic concept about why they may be a good team despite their underdog status is pretty good, though. Baby Steps takes math to the tennis court. Baby Steps has been pretty decent so far. I liked the way they started the show in the middle of the first match, then went back and brought us through everything that it took to get there. I also like the mathematical approach to tennis concept. The first real match just ended in episode 6, but they did a decent job of showing interesting gameplay. The artwork looks a bit like the show is being broadcast from the 1990s, but I have to give the creators props for doing the best job of incorporating a girl meaningfully into the storyline. The main character isn’t a jerk; he isn’t loud, or whiny. Unfortunately there is a hint that he has superpowers (really sharp eyes). At this point I’m still watching all of these shows, so the season feels unusually tilted towards sports anime. I wouldn’t say these are all great shows, but they have been reasonably entertaining, so picking a show based upon your interest in the sport would be reasonable, if it weren’t for the fact that Ping Pong is so much better than the others. If you are not watching Ping Pong, you owe it to yourself to see it for yourself. Are sports anime your thing? How do you feel about having so many sports shows airing this season? Have a different opinion about any of these series? Tell me what you think in the comments below! I’ve been in a wheelchair since I was about two, and so never really participated in sports when I was young, which probably goes a long way in explaining why I find most sports so utterly boring. I’ll occasionally enjoy some of the more visually spectacular ones, like ski jumping, but that’s about it. Fiction wise, the goofier sports ones (i.e., Dodgeball) are amusing, but that’s about it. A few exceptions like “Field of Dreams.” Intellectually, I realize the drama elements of sports shows should still make them interesting, but emotionally, it’s just a no-go for me. Probably my loss. The only sports anime I’ve ever watched and enjoyed was — you guessed it — Chihayafuru. Speaking of Ski jumping, if you haven’t seen Werner Herzog’s film, “The Great Ecstasy of Woodcarver Steiner”, you should really check it out. It is visually compelling, but also a really interesting subject in that it is about people trying to fly (which of course they can’t, being human). Definitely one of my favorite films. It is only about 45 minutes long, so you might even be able to watch it on youtube. I never played sports as a kid. I don’t have a problem as severe as yours, but a birth defect prevents me from using my arm excessively. Since I never played, I never learned any of the standard sports, and I don’t follow any of the professional leagues. I still enjoy sports anime, though, because they are about human beings struggling to achieve their dreams. I also really like it when I learn about things, so sports shows that explain the strategies are interesting to me. 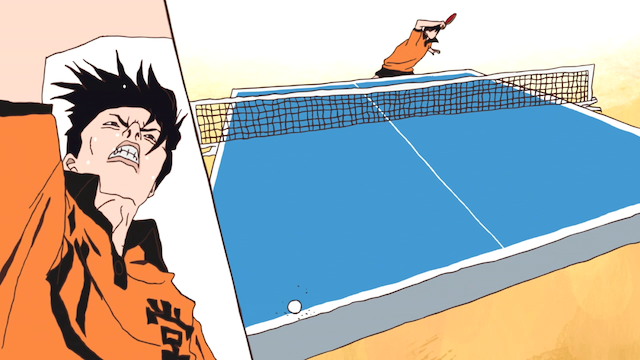 I’m loving Ping Pong and Haikyuu! this season. I don’t know why you think Hinata is annoying though. His enthusiasm is adorable to me and I’m liking over-the-top characters who are weird in their own way (I like tough-love than easy-love xD). Sorry – comment was stuck in spam-jail. I remember posting here before but somehow it didn’t got saved. Oh well, I’m loving Ping Pong too but why you dislike Hinata? D: He’s so adorable and energetic. Not to mention, I love the over-the-top characters of Haikyuu!! because they are completely insane (I read ahead in manga and it gets more exciting with addition of people). 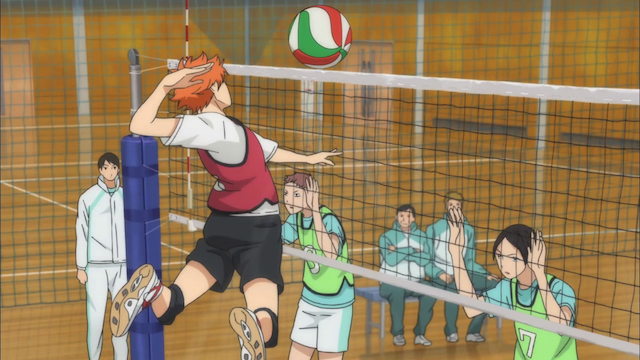 I should clarify, in Haikyuu I find both Hinata and “the King” (Kageyama?) annoying, as well as a few of the side characters. I just can’t imagine myself getting along with most of them. I think if I were alongside them I would find myself shouting, “Would you PLEASE shut up?” quite a bit. It isn’t that they are psychos that bother me. I actually like the bald senpai who makes yakuza faces. Despite the fact that he gets carried away, he actually has the good of the team at heart. I get frustrated with them when the noisy side comments show a disregard for what the team is trying to achieve. Hinata, for example, reminds me (perhaps unfairly) of Mihashi from Oofuri. Whereas I really liked that show, if Mihashi had a personality that didn’t require constant attention I would have enjoyed it much more. I just find the outbursts by some of the people on the team selfish. They have a collective goal, and instead of working together towards that, they are preening and whining, and yelling at each other. You have some valid points and as I’ve read the manga, I can tell you that all this whining and frustration actually help them bond more tighter. The thing with Karasuno team is that they are misfits with behaviour/skill-related issues. However, how they make sanity out of this insanity is what I like.